This resource is no longer officially part of our collection This resource has been removed from our collection, likely because the original resource is no longer available. If you have further information about the link (e.g. a new location where the information can be found) please let us know. 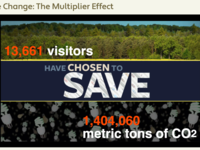 This web-based interactive exercise explores the concept of how individual actions can reduce energy consumption and greenhouse gas emissions. It illustrates how multiplying these choices and human behaviors on a larger scale can help mitigate climate change. Users are shown the consequences of their choices and asked to commit to making a difference.